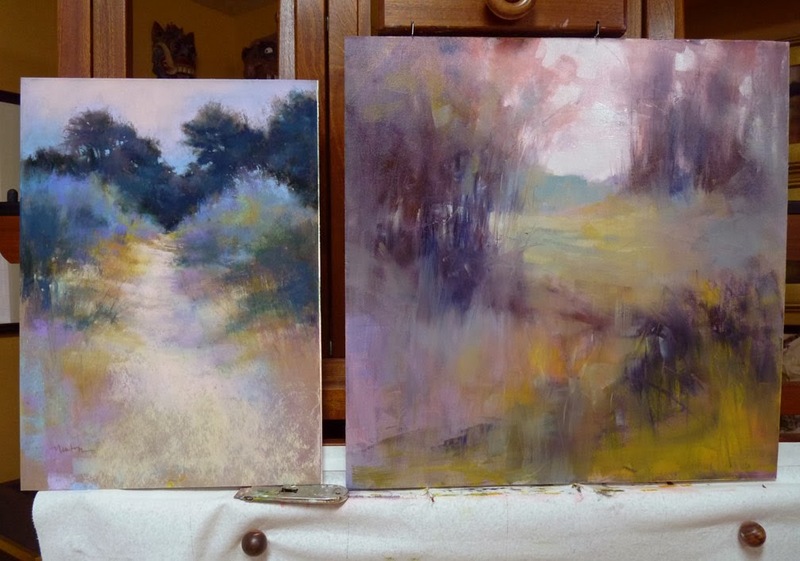 My day in the studio started with the oil painting on the right. This is the painting that followed Color Study for Destiny, sold a couple days ago from my Daily Paintworks Gallery. If you look at my previous post on this blog, you'll see that it has changed from my original intent, probably because I shipped the color study to its new home and didn't have it for reference. I got this far today on Destiny and decided to quit because I got lost with the color and needed a break. I like the values but the colors need more thought. I went for a dog walk in the rain then back to the studio to look for a pastel to work on so I would leave Destiny alone. I selected the painting on the left, Byway for Another Day, unframed it, and realized there were my color answers for Destiny! 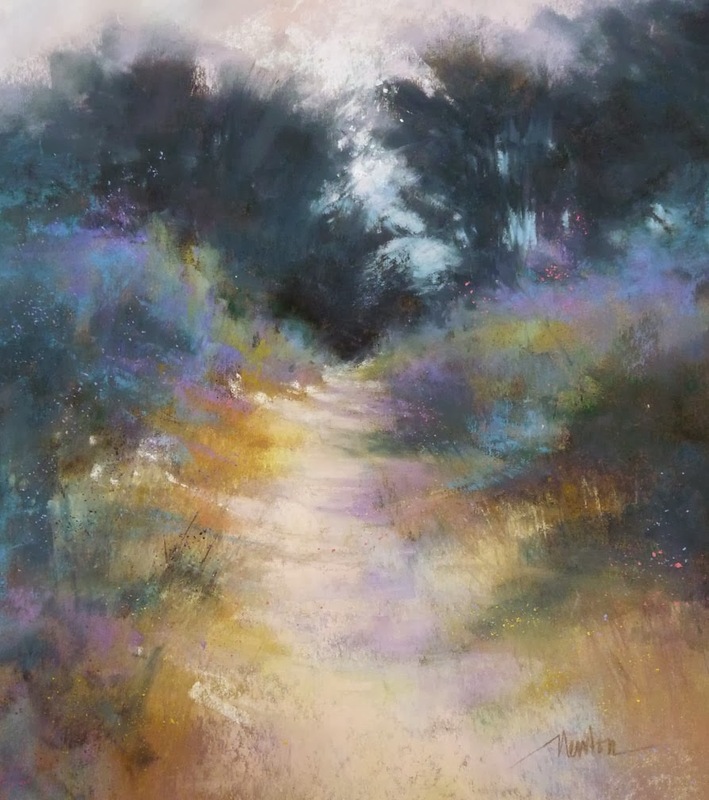 The backstory on Byway for Another Day: I painted it in an Elizabeth Mowry workshop in 2011. She paused by my easel many times throughout the day when I was working on Byway but commented on it only when I asked her about yellow. 'I would choose a quiet yellow,' she advised. Good advice of course! 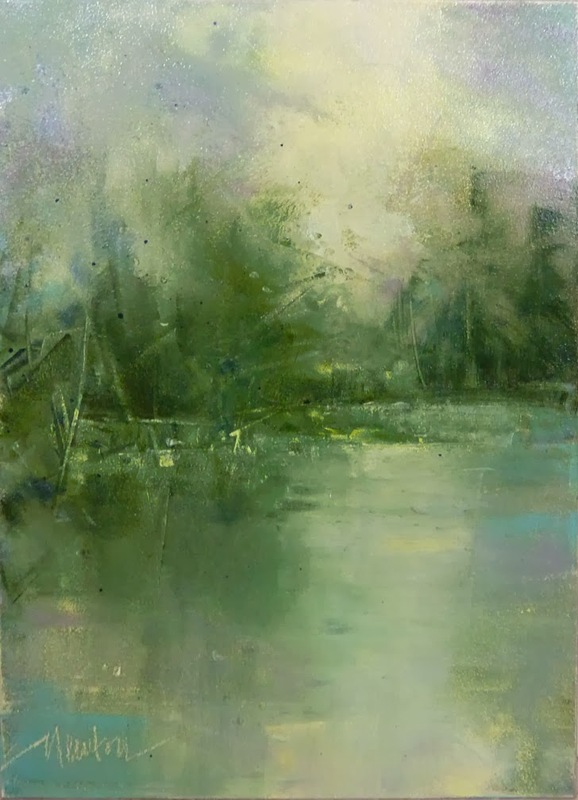 I love the painting but I have not loved the plein-air frame I chose for it and I now realize that all the roundy shapes in the top third need more wildness - I was more conservative 3 years ago. I'll make that change today and re-frame with an off-white mat to give it more breathing room in a simple walnut frame. Then, back to Destiny with Byway as my color study! Later post: Here is the new and improved version of Byway. Reworked the top third and the left side, cropped to nearly square format. I'm a fan of painting every day but sometimes life happens and it's impossible. For me, the next best thing is selecting one day a week as a paint-for-sure day. In my case it is Wednesdays. 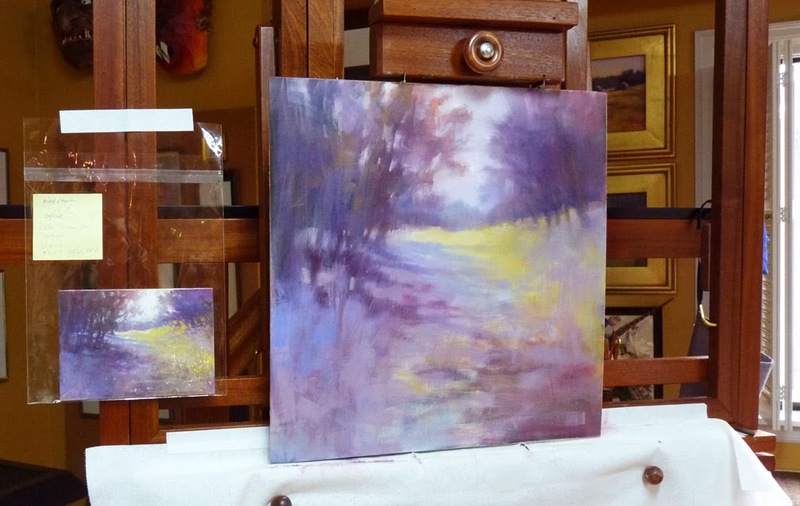 Here is what is on the easel this week. 18 x 18 oil, tentatively titled Destiny. I is about 40% complete but really, who can say how far it has to go? I just hope I know when to stop. There are two parts to this backstory - the composition and the painting surface. First, about the surface. Three years ago I prepared a couple dozen pink painting surfaces. 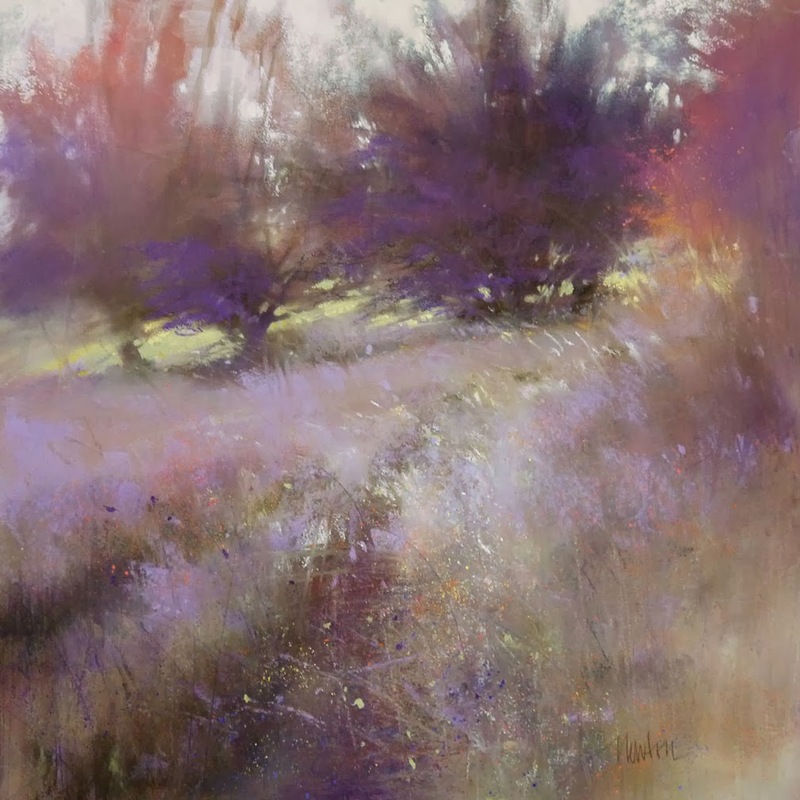 You can read about how I did it in this editorial I wrote for the Northwest Pastel Society. After using a few, I put them away in my flat file. 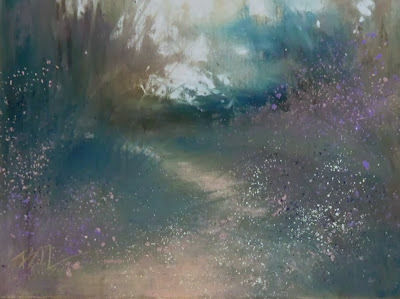 Last week, I started thinking pink and pulled one out and began painting A Simple Truth: Trust. Secondly, about the composition. Last week I rotated art at my galleries and brought home a small oil. I liked the scene but not the color/mood so I threw it in my studio garbage can, found the painting image in my computer, printed it out in grayscale and attached it to my easel, next to my "think pink" ground. 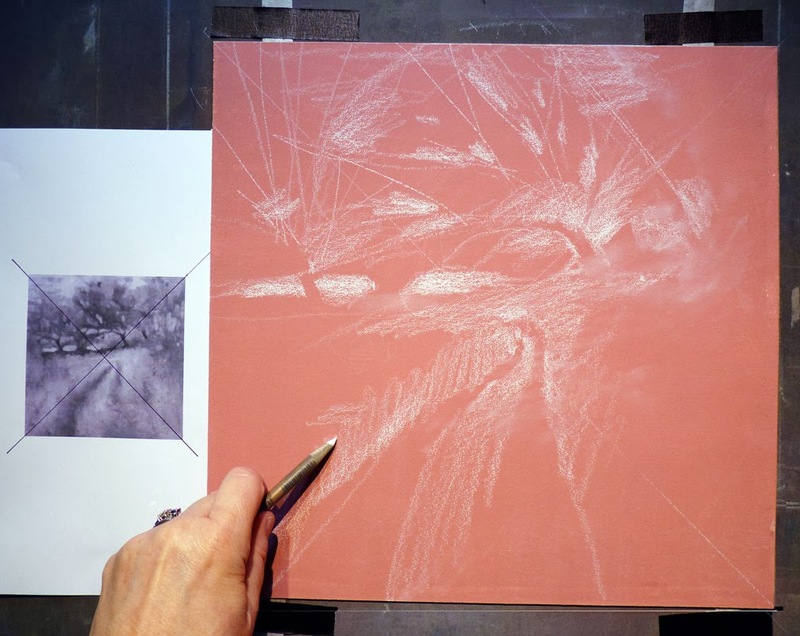 I transferred the composition onto my ground with a white pastel pencil (note the X through the ref photo and the pink surface - this helps me get everything in the right quadrant). By the time I finished the painting, the bottom half had been wiped off several times until I changed the angle of the road. Much better. 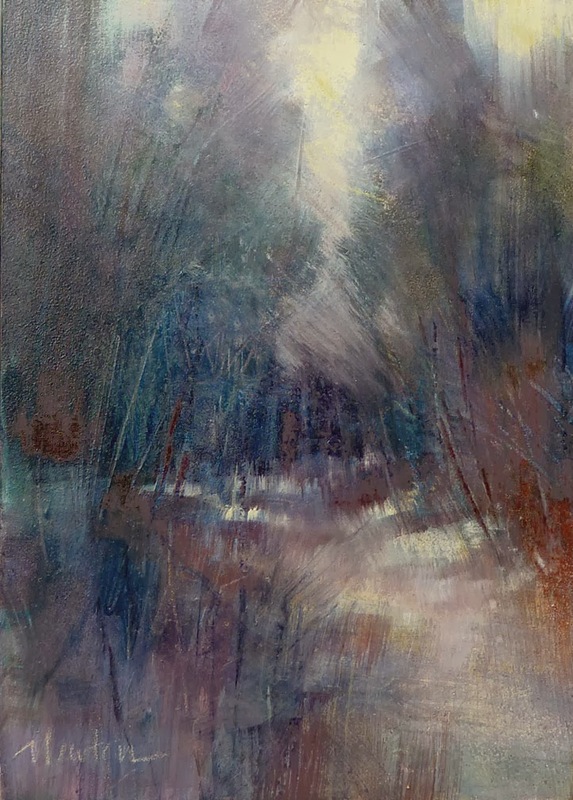 A wooded scene of light play among the trees. 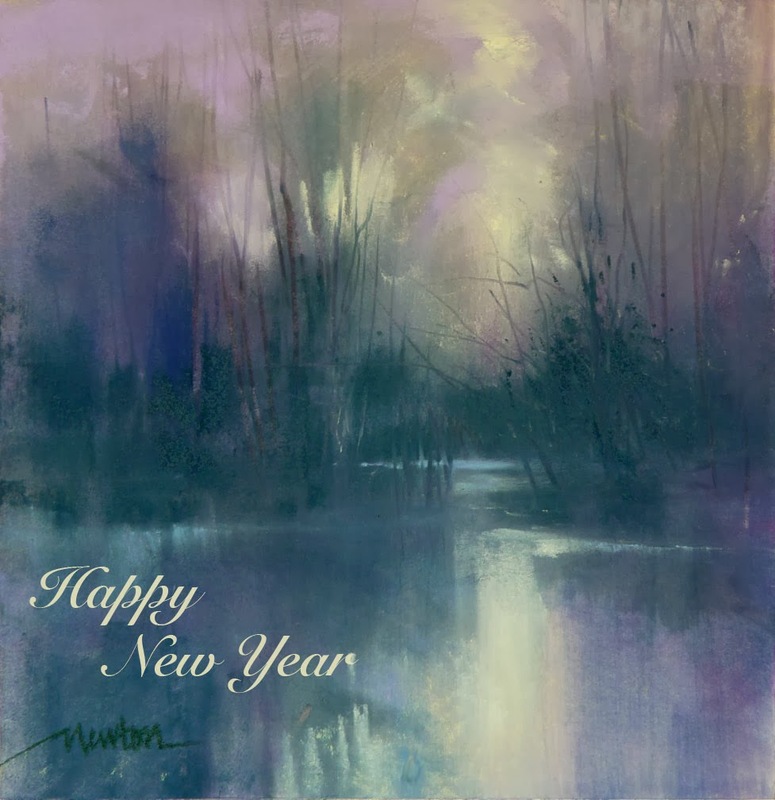 Oil painting in muted violet, cobalt and rosso veneto, handmade oil color by Williamsburg. Click here for purchase information and the magnifier. Long ago, I created an art database in FileMaker Pro and the format hasn't changed much over the years. Quick, efficient and organized, but not the same as having a hard-copy of the image in my hands. So, I keep a deck of art cards, each about 2 x 3 inches. 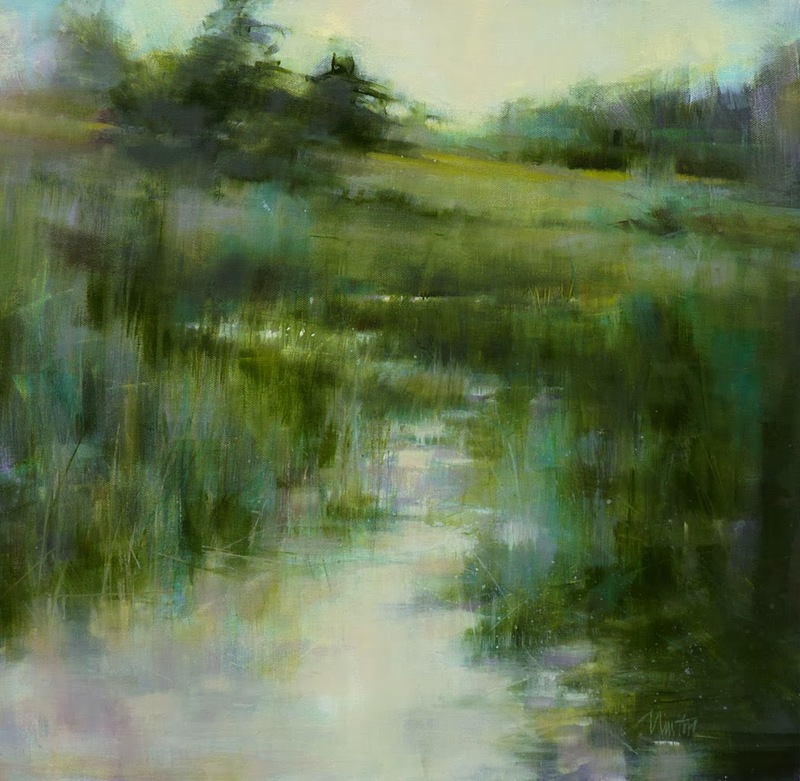 These are printed from the information in my data base and include the image, title and art number as well as gallery notes that tell me if the painting has been in one of my galleries. 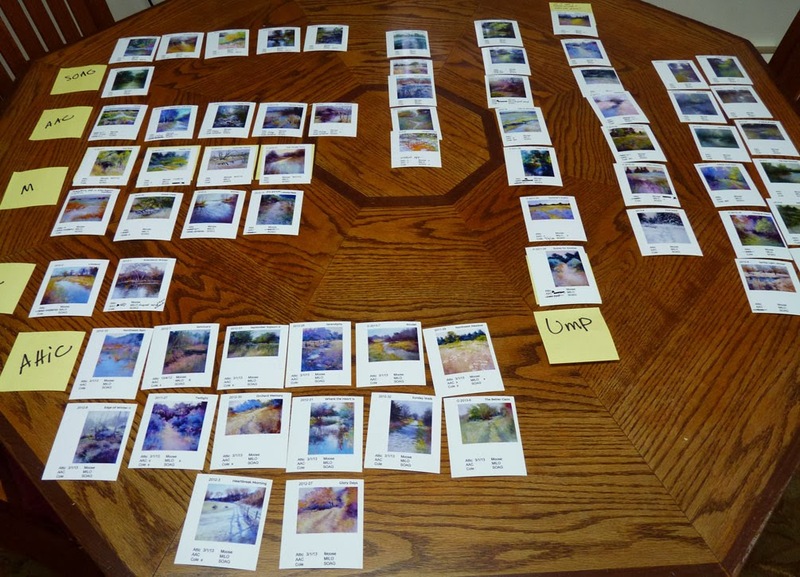 When it is art-rotation time, I spread the cards on the table in my studio to select a new body of work. Using this process, it is easy to see if the images compliment each other. 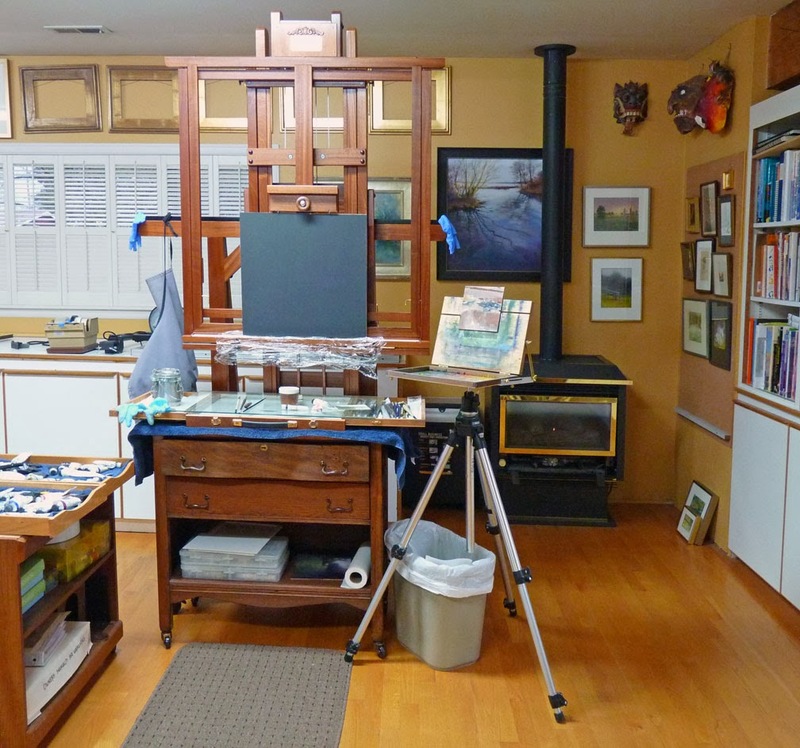 In this photo, work that is at my studio and available is grouped on the right side of the table. The number of pieces there should reassure me that I can take that painting sabbatical I am supposed to be on but these foggy winter days make me want to paint. Several years ago I painted "Sitka Meadow." 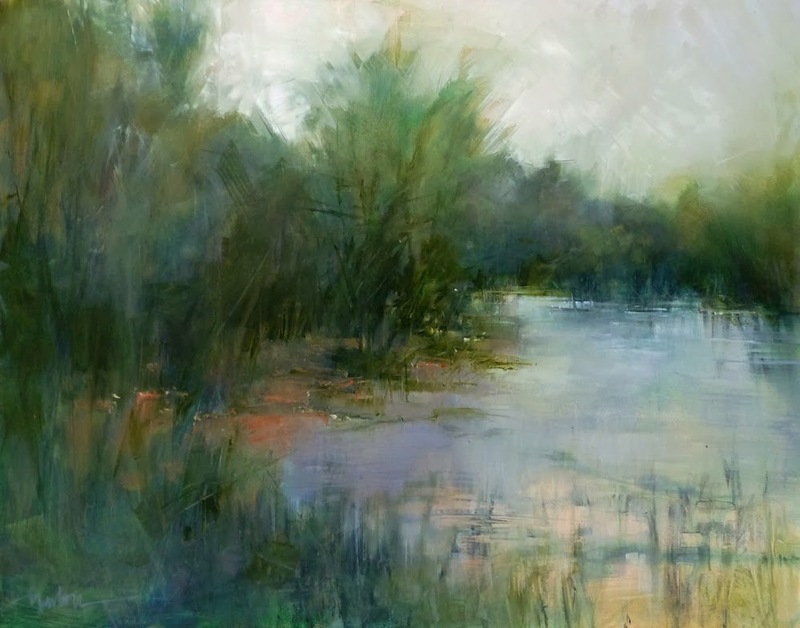 It received a Third Place Award at a well-known show and then went on to three of my galleries. I loved it then, I love it still, but apparently no one else does because it is back in my studio again. I have a couple more places to show it, then it will move into my Artist's Collection. This week I used it as reference for a new oil painting, shown below. 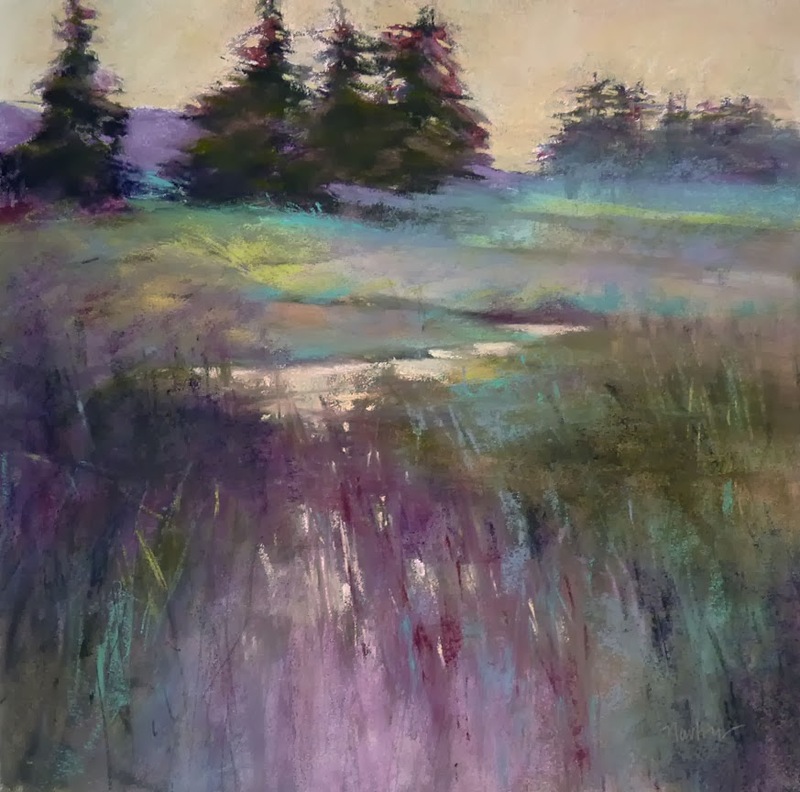 In the first few days of this new painting, the composition was pretty much the same as the original, then "Sitka Meadow II" took off in a new direction. Different color and composition. I'm very happy with it and I hope it finds a new home on its show and gallery travels. After the dinner dishes were done last night, I came back into the studio and began painting for an upcoming small works show at State of the Arts Gallery, Olympia, WA. This one is TINY at only 3.5 x 5 inches. To paint that small with abandon and expressive strokes, I started with a surface about one inch larger all the way around. Using a mat with a 3.5 x 5 inch window, I selected the best view of the scene. Near Olympia, there is a road called Bordeaux. We did a photo shoot there several years ago and the scenes linger in my mind. I'm starting 2014 with the simple truth in my painting. I will try to hold that thought all year to create paintings for the viewer to contribute their memories and emotions without interference from me. "A Simple Truth" is oil on Gessobord, 7 x 5 inches, unframed. For purchase information, click here. I would like to name this painting "Through Mama's Eyes" because the reference photo (top) was taken by my mother years ago. 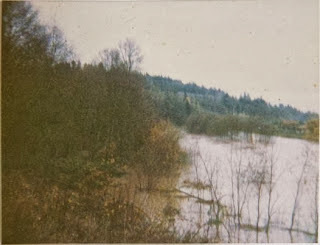 It appears to be flooding in our home town, Auburn, Washington. Instead, it is the more generic, "The Past Revisited," 16 x 20 oil. Mama's photos were usually blurry and sometimes only a black spec in a sky of blue. That would have been either a distant hot air balloon or a distant plane piloted by one of her grandsons. She had a need to record facts, events and weather, first through her written journals then through photos. I guess I inherited that gene from her. About my blogs - At the beginning of my 7th year of blogging, I send my heartfelt thanks to you, my visitors and subscribers. Communicating with others is important to me. This Art Journal blog will continue to be visuals of my work in process, tips and tricks. Last year I created a new blog about being an artist. Occasionally I will include links to that blog for additional thoughts or the backstory on a subject. About selling work online - I have been selling small unframed paintings, at special prices, on Daily Paintworks since 2011. Again, THANK YOU to all, world-wide, who have given my art loving homes. Last year, I also began posting work on Etsy. Both sites offer affordable art - I have added to my own collection this way. In the coming year, I will introduce paintings on DPW through the auction with a Buy It Now option. If a painting doesn't sell, it will go to my Etsy store at an increased price. After a time on Etsy, I'll frame it and take it to one of my brick-and-mortar galleries for in-person viewing. Most galleries work on 50% commission so the price will reflect that. Each of these three venues have different audiences. About social acceptance - I figured out how to paint just for myself without considering my social acceptance concerns! 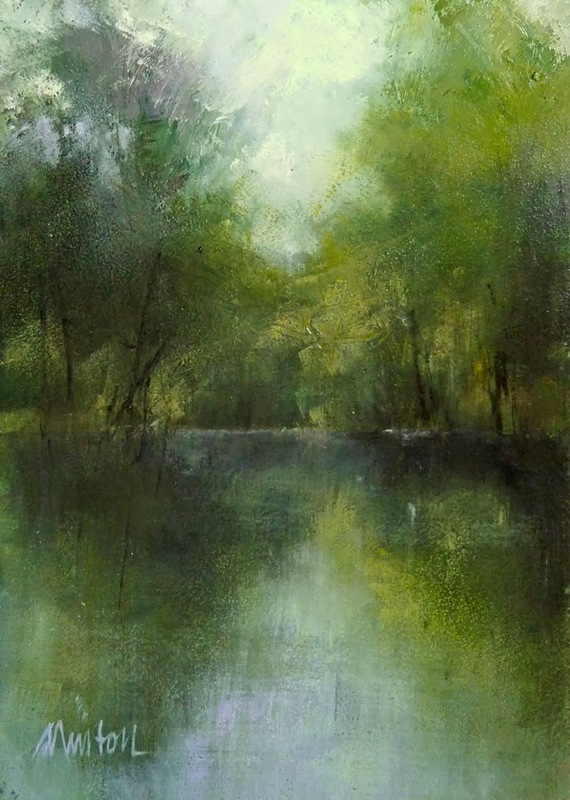 For the next few months, I am going to push myself out of my comfort zone by painting a new subject in oil (I am most comfortable working in pastel). The subject will be the interior of our home of 25 years. The paintings may be so bad that I won't post them on my blogs and they won't be for sale. I'm working now on a painting of the upstairs bathroom sink. By spring, I should have a collection of scenes from our home to hang in our new house. About moving furniture - I love moving furniture. I have reclaimed my studio as a working space after Christmas and New Year's Eve gatherings. 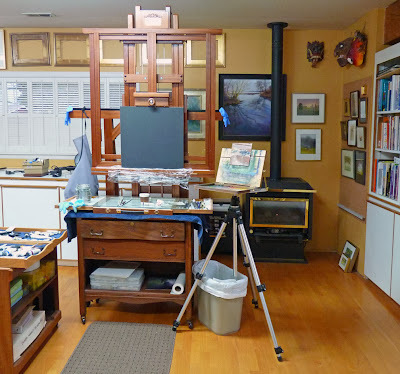 My oil easel is in a new location with color-corrected fluorescent (cool) and daylight (cool or warm depending upon the season) while the pastel easel remains under gallery lighting (warm) . I'm trying to decide what to do about lighting in the new studio. If any of you have studio lighting opinions, I'd love to hear them. About REVERT TO DRAFT - DO NOT select this option as I just did. After a thoughtful and well written post, I just accidentally deleted 95% of it. Revert to draft is NOT the same as going back to the last save! As a result, you're getting second-hand text from my memory. Sorry.